Title: The Avengers Must Die! Synopsis: Marvel Super Action #17 reprints the second part of Avengers Annual #2 (September 1968) in which the Avengers are transported through time by Dr. Doom’s time machine to 1963 where they face off against the original Avengers team of that era. The time traveling Scarlett Centurion promises the 1963 Avengers that he will solve all of Earth’s ills if they agree to defeat all of the planet’s heroes and villains. In the second part of the story, the two sets of Avengers battle and the team from 1968 manages to prevail against all odds. They return to Dr. Doom’s castle in Latveria intending to use his time machine to restore the change of history caused by the Scarlett Centurion. The villain materializes and fights the Avengers, defeating Captain America, Wasp, Black Panther and Hawkeye before Goliath shrinks out of sight and manages to activate the time machine. Goliath’s ploy succeeds and he restores history, undoing the damage done by the Scarlett Centurion, who we learn from the Watcher is actually an early incarnation of Kang the Conqueror! 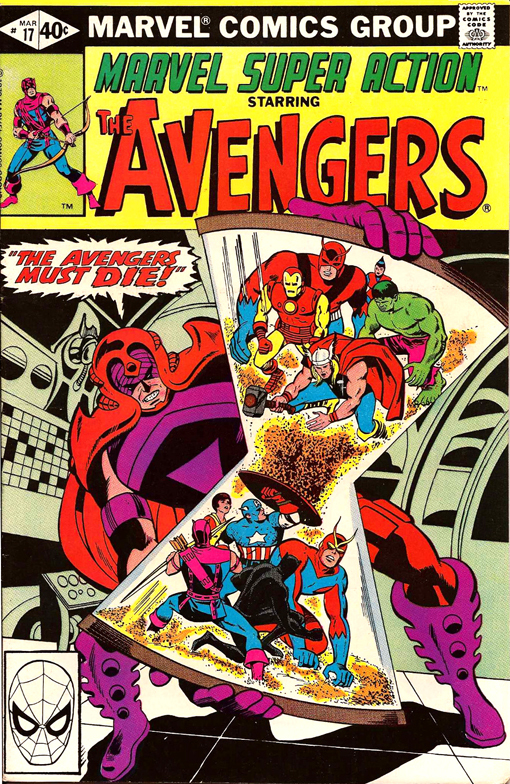 The cover of this reprint is taken from the splash page of part two of Avengers Annual #2.